On approximately 200,000 acres, the 2,000 California Raisin growers produce 100% of the U.S. raisins, totaling approximately 300,000 tons annually in an area within a 60 mile radius of Fresno, California – known as the central San Joaquin Valley. Two-thirds of the U.S. raisin production is consumed in the U.S. and Canada, while one-third is exported to nearly 50 countries with Japan and the United Kingdom being the top two export markets. 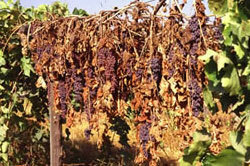 Raisins are essentially dried grapes of the “Vitis vinifera” Natural Seedless varietal type and are typically dried by the sun, whether it is on paper trays or dried on the vine. Natural (Sun-Dried) seedless raisins include the Thompson seedless and other newer cultivars such as Selma Pete, Fiesta and DOVine. California Golden Seedless and California Dipped Seedless raisins are mechanically dried and processed. Other raisin varietal types include Zante Currant, Muscat, Monnuka, Sultana, and other Seedless. Raisins may also be further processed into Raisin Paste and Raisin Juice Concentrate. Once dried, the raisins are brought from the vineyards, stored in wooden bins, and processed as needed by having their stems and capstems removed, then sorted by size, cleaned and washed in water to assure a wholesome and safe final product. Click here to view the Raisin Administrative Committee’s videos about growing and selling of California Raisins – Farm to Table. Quality control plays an important part once the raisins are at the plant. Before the raisins are taken from their bins, government inspectors use long prods to take samples from the middle of each box. Strict standards must be met to ensure each box of raisins is free of imperfections. Next, the raisins are processed. They are poured into a hopper which feeds onto a series of conveyor belts and drums that remove any remaining stems, chaff or light weight fruit. Then, the raisins are sent through a brisk vacuum air stream to catch any undesirable material that may have been missed. Then they are size-graded and thoroughly washed. The raisins then move past a sophisticated laser sorter that uses light beams and a computer to determine if anything other than raisins is passing through the stream. If the computer determines something is not a raisin, it instantly sends a small burst of air to knock the material out of the stream into a trough below, all at incredibly high speeds! Hand inspections are done throughout the packaging process by quality control technicians to make California raisins the cleanest, highest quality in the world! 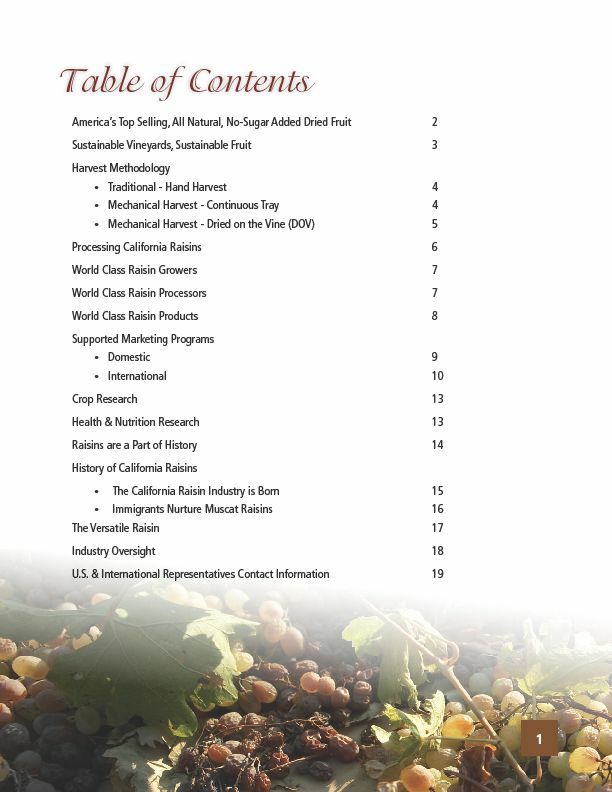 California Raisins Industry Brochure Read why California Raisins are the best worldwide! In the California Raisins Industry Brochure, you will find the history, the varietal types, and how raisins are used today in so many applications and delicious recipes. Click image on right for PDF of the California Raisins Industry Brochure. Depending on connection speed this file may take up to 1 minute to download. Dried fruits have been grown and dried from fresh fruits for thousands of years. Originally used in place of fresh fruits when fresh was out-of-season, dried fruits were actively traded to those countries where growing and drying conditions made these products a rare and desired commodity, especially in northern Europe. Grapes have always been at the top of these fruits most suitable for drying and raisins continue as the number one dried fruit today. All natural, no sugar-added dried fruits, such as California Raisins, have been proven to have the same nutrient value as fresh fruits as only the water is taken out in the drying process. Additionally, in recent years there is a cloud swirling around processed foods with added sugar, and there are dried fruits which would be not be palatable without the addition of processed sugar. Whether you are a food manufacturer, an artisan baker or homemaker seeking to provide your family with the most wholesome foods, please carefully read all ingredient labels. Natural seedless raisins are dried by the sun, then loaded into bins for delivery to the processing plants. 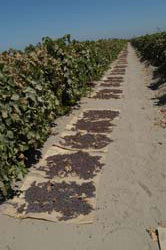 The raisins can either be dried on paper trays on the ground between vineyard rows or dried on the vine, and mechanically harvested once the desired level of dryness is achieved. Before they are unloaded from their bins, government inspectors take long prods to gather samples from the middle of each box. United States Department of Agriculture (USDA) inspectors examine incoming fruit to ensure that each box meets incoming fruit guidelines. Next, raisins are cleaned, which means they go through a series of conveyor belts and drums to remove remaining stems, chaff or lightweight fruit. The raisins also are sent through a vacuum air stream to catch any other undesirable materials. Finally, they’re size-graded and thoroughly washed in pure water. In preparation for packaging, the raisins are moved through a laser sorter. The sorter’s light beams, along with a computer, to see if anything beside raisins is passing through the stream. If material other than a raisin is present, the computer sends a burst of air to knock it out of the stream of raisins and down a trough. California Raisins are inspected under the most rigid standards by both plant quality control technicians and USDA inspectors throughout the packaging process, thus assuring that California Raisins are the cleanest, highest quality in the world. After final inspections, raisins are automatically weighed and packed in a variety of bulk industrial and convenient retail sizes. California Raisins are then shipped throughout North America and the world for consumers to enjoy. Are there different sizes of raisins? California Raisins come in three sizes: Select, Small, and Mixed. Select size raisins means that no more than 60 percent, by weight, of all the raisins will pass through round perforations 8.7mm (22/64-inch) in diameter. Small size raisins means that 95 percent, by weight, of all the raisins will pass through round perforations 9.5mm (24/64-inch) in diameter, and not less than 70 percent, by weight, of all raisins will pass through round perforations 8.7mm (22/64-inch) in diameter. Mixed size raisins means a mixture which does not meet either the requirements for Select size or for Small size. What is Raisin juice concentrate? From part of the crop, the processors make raisin juice and raisin paste. Raisin juice is a pure extract of raisins. Throughout several processing stages, raisins are leached with water to produce raisin juice. The liquid is then evaporated in a vacuum pan to produce a self-preserving concentrate. Raisin juice concentrate contains a minimum of 70 percent natural fruit soluble solids. It’s added to a variety of foods, including dairy, confectionery and baking items. Raisin juice extends the shelf-life of bread products; it is a natural substitute for preservatives; and it naturally sweetens and colors baking goods. For confectionary items, raisin juice acts as a sugar substitute and a filling for hard candies and molded chocolates. In crisp cookies and crackers, raisin juice helps control breakage. With chewy or soft cakes and cookies, the raisin juice can help maintain moisture. It also is a natural binding agent in cereal bars. Raisin juice serves as a natural syrup for yogurts and ice cream. It enhances the color and flavor of chocolate milk and ice cream. It also brings out the flavors of condiments and is an all-natural coloring agent. Raisin paste is made from 100 percent raisins, produced by extruding raisins through a fine mesh screen and then heated to make the finished product malleable and easy to use in a wide variety of product applications. Raisin paste can be used to add visual appeal and flavor. It’s a stable ingredient that sweetens naturally. Raisin paste is used in sundae-style yogurts and cottage cheese, as well as in ice cream and frozen novelties. It’s also found in fruit-filled cereal products, granola bars and extruded breakfast cereals. Raisin paste has excellent sweetening capabilities in fine confectionery fillings and soft-center candies. In bakery items, such as breads, cookies and pastries, the paste inhibits molds, extends shelf-life and enhances flavor.